Just When You Thought Italian Cuisine Couldn't Get Any Better, It Did. Surely there is no doubt that Italy is good at food. Love of gastronomy (and, arguably, soccer) is the true great unifier in a relatively young nation that historians have often referred to as a “geographic expression”—a land bound by mountains, seas and cooking ingredients but not by a sense of national identity. The process of Italian unification ended some 120 years ago, but Italy’s most cherished recipes span back to the beginning of Italian civilization and often reflect the complicated history that shaped it. Take pizza for example: piping hot from a wood-burning oven with steaming tomato, molten mozzarella and fragrant, fresh basil. It was invented in 1889, during the Risorgimento, when a Naples chef was called upon to prepare a meal for Queen Margherita that would reflect the mood of the era. He produced a popular people’s dish in honor of the tricolore, or the Italian green, white and red flag. Vizzari has backed his impressions by teaming up with the Eta Meta Research institute to carry out one of the most complete inquiries into what motivates Italian chefs. Some 200 top chefs were interviewed and seven out of ten (71 percent) confirmed that an Italian identity and Italian ingredients was their biggest priority. It is precisely this return to italianità and the enormous boost in confidence that it has inspired that motivates Italian chefs today. “Italy has always been recognized and envied for its extremely rich patrimony of ingredients,” says Vizzari. “In the past, it has not been able to get value or profit from this. 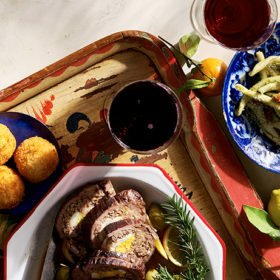 Italian foods today, from mozzarella to pasta, from wines to cured meats, have never been as popular abroad as they are now.” It is the outside world’s love for all things Italian, plus efforts by the Italian government to promote gastronomy and wine, that has fueled chefs’ creative fires. Organizations like the Piedmont-based Slow Food that promotes biodiversity and stands against the homogenization of food have also done a lot to move the emphasis back on individual ingredients: “One of our goals for the future is to forge stronger relationships between the world of food producing communities and the world of chefs,” says Slow Food President and Founder Carlo Petrini. Another important legislative measure is the application of a government DOP (for Protected Designation of Origin) seal on most cheeses, oils and cured meats. It is a guarantee to consumers that a food product is what it says it is and works just like DOC and DOCG classifications for wine. Indeed, a microscopic, almost maniacal, dedication to the origin and correct season of primary ingredients drives la nuova cucina Italiana. It’s not enough to use prosciutto when chefs have access to Prosciutto di Parma that has been dried by special sea breezes that impart succulent sweetness. Other ingredients like the prized Siccagno tomato, which is well adapted to drying, were saved from virtual extinction thanks to their rediscovery by chefs. Some restaurateurs are descendents of or related to fishermen and can thus deliver the freshest catch of the day. Luciano Zazzeri, who runs La Pineta in coastal Tuscany’s Marina di Bibbona, sources orata (bream), triglie (red mullet) and rombo (flounder) directly from his uncle. Ciccio Sultano of Ristorante Il Duomo in Ragusa Ibla, Sicily also sources his ingredients locally, favoring the black pig of Nebrodi (indigenous to the island) over any other suckling pig. But in Italy, this renewed attention to origin is paired with a vast repertoire of recipes and cooking techniques handed down by Grandma. In fact, of the 200 chefs interviewed in the Espresso poll, only 6% believed that Italian cuisine could benefit from extreme experimentation in the kitchen, such as molecular cooking and foams. Other factors have contributed to make Italian cuisine what it is today. For one, a new generation of celebrity chefs exists in a country that never paid much heed to celebrity chefs. Trailblazers like Gualtiero Marchesi, with trendy restaurants in Brescia and Rome, and Gianfranco Vissani near Todi in Umbria have opened the way for a new generation of Michelin-starred chefs—there are, in fact, more such chefs today than ever before. More attention is also being placed on a restaurant’s look and décor and the full eating experience that environment can shape. “Even little things like the anti-smoking laws have helped make an Italian eating experience better than ever,” says journalist Bruno Gambacorta, who hosts a weekly gastronomy television show called Eat Parade, of Italy’s 2005 surprisingly well-executed ban on smoking in restaurants, bars and pubs. With more specialized food and wine magazines and satellite channels, like the 24-hour Gambero Rosso cooking channel, the media has done its part to highlight the evolution underway in Italian food. Regional trade exhibits, like Identità Golose held in Milan in January, in which the country’s top chefs convene to discuss new trends and techniques, and Salone del Gusto in Turin in which food producers and farmers present their specialties, are more popular than ever before. And consumers have become more demanding as well. Lastly, confidence in Italy’s winemaking potential has helped trigger a new way of looking at Italian food. Quality wines began appearing in significant numbers only a few decades ago and as consumers learn their Barolos from their Brunellos, they also want to know about wine’s pairing characteristics with foods from different regions. Refrigerate the the prawns for at least two hours at 55 F. Remove and rinse under cold water. Make a small incision in the shells with a knife. Place all of the fish in a bowl and mix with the crushed garlic, oregano, oil, lemon juice and salt. Place over a hot grill for no more than one minute per side. Let the fish rest in a bowl for 10 minutes sprinkled with more lemon juice and oil. Cook the four prawns in a hot oven for an additional two minutes after grilling. Place all ingredients except broth inside a blender. Gently blend, dripping in the broth slowly so that the mixture is dense but not runny. Do not blend excessively. Place basil leaves and garlic in a small blender and add olive oil in last to achieve an aromatic oil. Set aside. Blend tomato sauce until very fine. Heat the fish for no more than two minutes in a hot oven. Heat the mozzarella sauce in either a microwave or double boiler. Pour the mozzarella into deep serving dishes, creating a 1Â¼4-inch thick layer. Decorate with droplets of tomato paste and the basil-infused oil on the edges. Place the heated fish as you’d like on top of the “fake pizza” and position the prawn on top. Serves 4. Enjoy with a crisp white wine from Sicily or Alto Adige.